Kansas City already has emerald ash borer infestations. "The city has a three-part management plan in place: to treat ash trees every three years by trunk injection; to remove ash trees that cannot be treated over a five- to six-year period, and to replace each of those ashes with a new species." Emerald Ash Borer (EAB) is an exotic beetle from Asia that arrived here in 2002 and it is responsible for killing hundreds of millions of ash trees across North America. In order to save your Ash tree it will need to have a preventive injection to be fully protected: even healthy trees will eventually become infected if not treated. Many municipalities have lost nearly 100% of all their ash trees. We now have a product that can be safely injected into your ash tree, thus making the treatment safe for your children and pets. Several recent surveys suggest that mature trees in a well maintained landscape can add 7% to 19% in home value, let us help you protect your investment. The cost of replacing or removing an infected or dead tree can cost 1000's of dollars, most tress can be protected for $60-$120 per year; depending on size. For example a 60 inch tree (Circumference 12 inches from ground) costs $112 dollars a year. That same tree can cost anywhere from $1,200 to $1,500 to remove and grind depending on location. In effect, you can keep your tree alive for ten years at the same cost to treat plus you get to keep your beautiful tree which adds value to your home and lowers utility bills. Be aware that EAB can be present in ash trees for 3 years before symptoms occur. This is a excellent video to help you determine if you really have a EAB issue and need to call us for treatment. Of course we'll be happy to do a free evaluation. It’s the most efficient system on the market. We treat trees faster and that saves you money! It is the most proven system on the market. No other system has saved more Ash trees. It is the friendliest system to your precious trees. WE DON'T DRILL into your tree which causes permeant damage. Treating ash trees for EAB is an annual/biannual treatment. This repeated drilling into your tree can cause serious damage and is counterproductive. Soil drenches are ineffective for larger trees. They take up to a month to reach the canopy, where the borers feed, and are unreliable and costly both to the pay check and environment. Your tree DOES NOT need to be treated for a life time just until the threat is gone. Why use our product over Imidacloprid and Bidrin (Mauget)? Its cost effective. Treatments only need be made once every other year effectively reducing costs nearly in half from other treatments such as Imidiculprid and Bidrin. 2. Has an extremely broad range of pest control; targets Mites and Lilac Ash borer as well as EAB. Discounts available for multiple trees and neighborhoods. 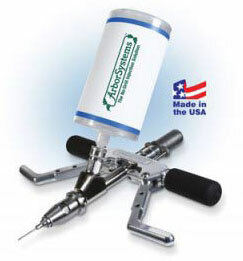 Use Direct-Inject System — the only no-drill tree trunk injection method that is easy, fast, proven effective and tree-friendly. The Wedgle Direct-Inject System is the fast, effective, tree-friendly way to treat trees for a broad range of destructive pests, harmful diseases, and nutrient deficiencies including reduce risk of Pine Wilt Nematode, Emerald Ash Borers, psyllids, aphids, Oak Wilt, Dutch Elm Disease, Anthracnose, chlorosis and growth regulators. Virtually eliminates exposure concerns. No mixing, no caplets, no spraying or soil drenching concerns. • Minimizes wounding to keep out fungi, bacteria and insects. • Prevents air from getting into the tree. When air is allowed into a tree's vascular system, it cuts off the flow of water and nutrients. • Allows multiple treatments without damaging the tree. • Requires no drills, power supply or other bulky equipment. Pointer is one of the most widely used and proven-effective insecticides on the market today. Pointer provides reliable systemic insect control on a wide variety of landscape ornamentals. Call for a free estimate or evaluation 316-685-1794. "Emerald ash borer is responsible for killing or damaging 20 million ash trees in Michigan, Indiana, Ohio and Ontario, Canada. Financially, the United States risks an economic loss of $20 billion to $60 billion because of this pest. A complete devastation of ash trees could seriously affect our ecosystem."